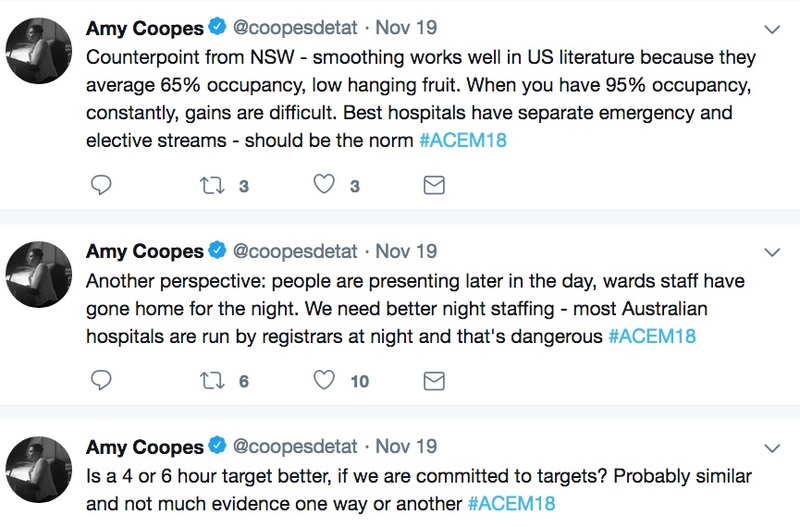 Home Croakey Conference News Service 2018 conferences #ACEM18 Under increasing pressure in Australia and NZ: how are emergency departments coping? Debating wins and challenges in tackling access block. Photograph by Amy Coopes. 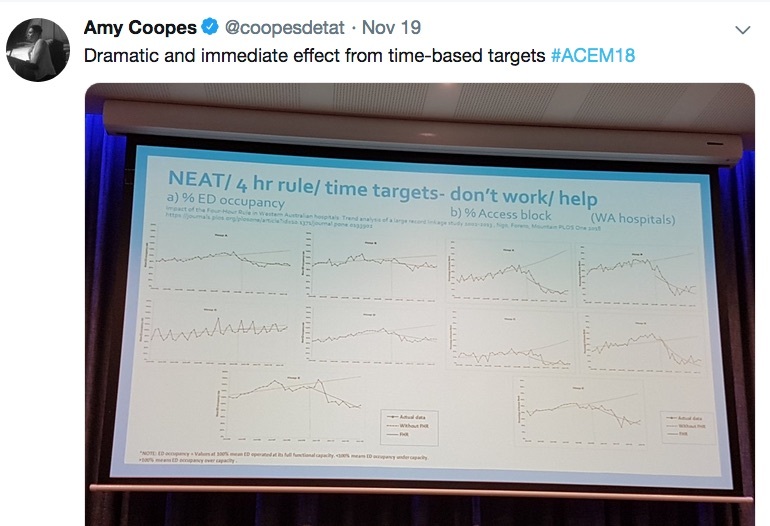 Time-based targets had significantly reduced overcrowding in Australian and New Zealand emergency departments (ED) over the past decade, saving thousands of lives, an emergency medicine conference was told recently. However, the effectiveness of these targets had plateaued and major equity issues remained, particularly for mental health patients, the conference heard. 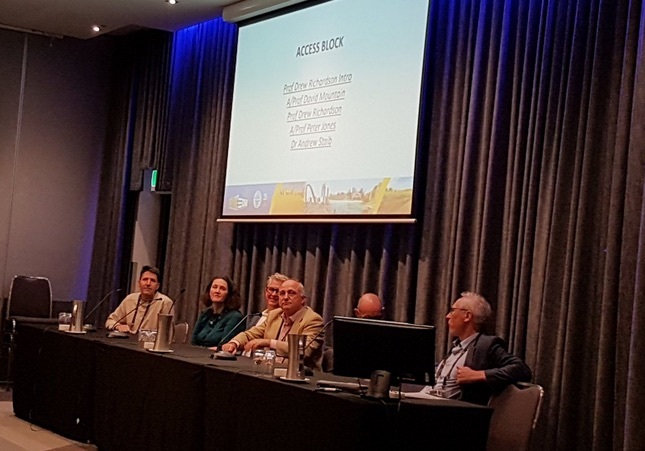 It’s been 10 years since a landmark summit brought together groups, including the Federal Government, Australian Medical Association and Australasian College for Emergency Medicine, to discuss a crisis in ED waiting times and crowding – an issue known as access block. 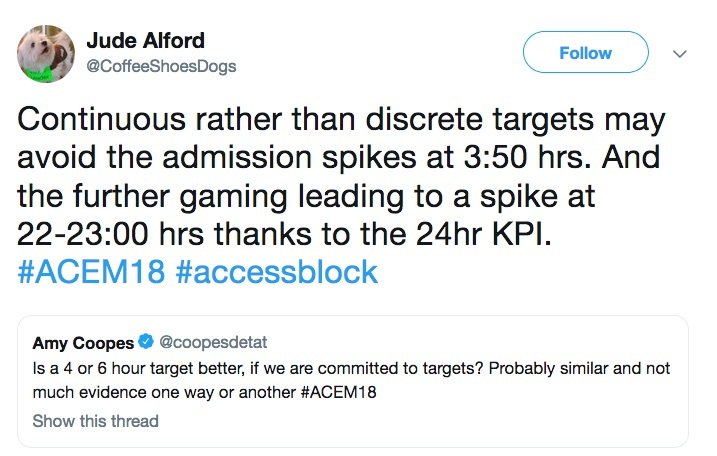 The 2008 Access Block Solutions Summit saw the rollout of time-based targets modelled on the NHS four-hour rule (known locally as the National Emergency Access Target or NEAT), which sets a limit on how long someone should wait in an ED before being admitted, transferred or discharged. Critics of the policy question its value in improving patient outcomes and caution that it may actually compromise patient safety and care, pointing to the Mid Staffordshire experience in the UK. 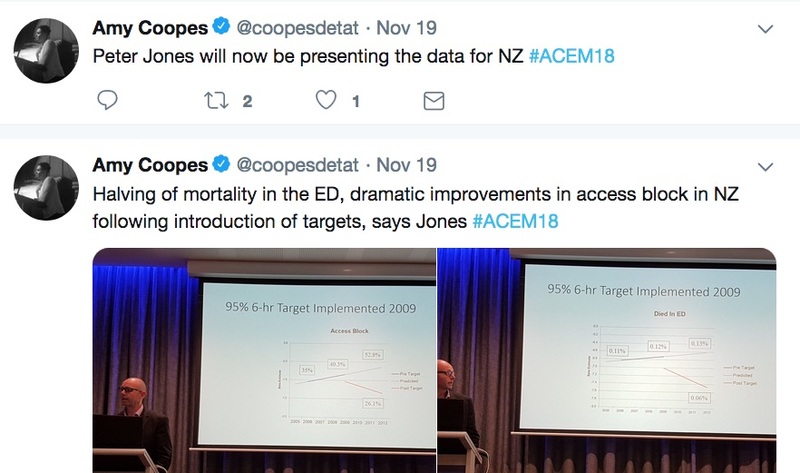 But the rollout of targets had significantly improved flows through Australian and New Zealand EDs in the decade since the access block crisis talks, delegates to the recent ACEM annual scientific meeting heard. This was despite exponential increases in demand and a 20-30 percent surge in emergency workloads. 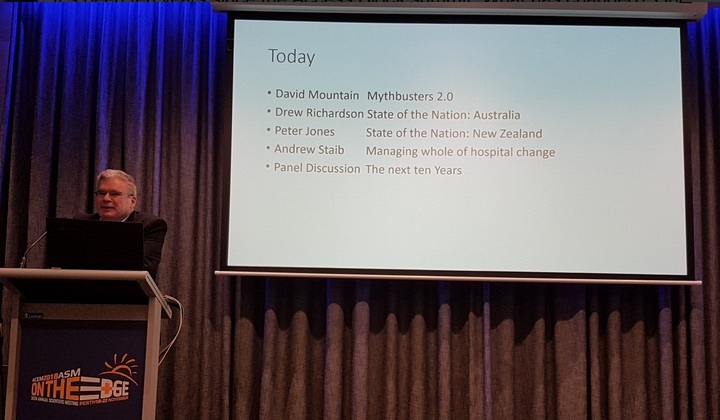 Drew Richardson, a professor at ANU and senior staff specialist at Canberra Hospital, reflected on how much had changed in Australian emergency medicine over the past 10 years, with the number of accredited EDs almost doubling and demand skyrocketing, along with presentations and admissions. Even the most conservative estimates suggested that workloads had increased by 20-30 percent, and this did not factor in new hospitals, he said. 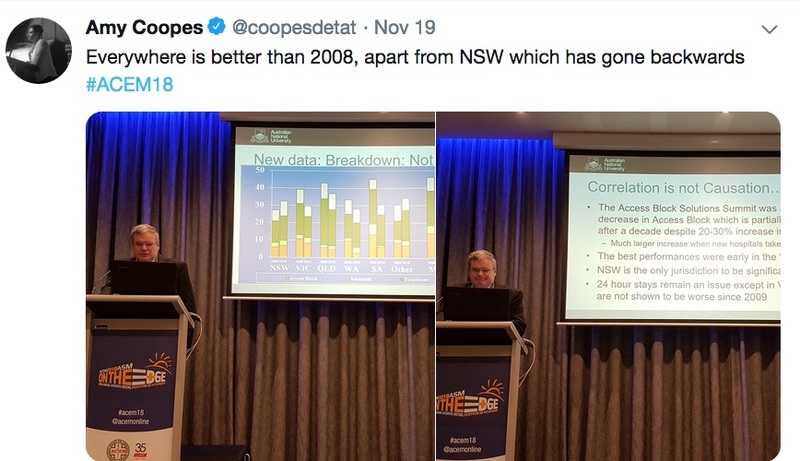 Despite this, Richardson said there had been a sustained decrease in access block since 2008 everywhere – except NSW, which had gone backwards. The greatest improvements had been seen early in the so-called NEAT era, and though things had been relatively stable, they had started to worsen again in recent years. Overall, he estimated that one-third of the workload in ED remained caring for inpatients who had been admitted but were awaiting beds. As far as delays were concerned, Richardson said 24-hour stays in the ED – something for which there was “never any clinical justification” – remained an issue in every state except Victoria, but there were significant disparities for mental health patients. 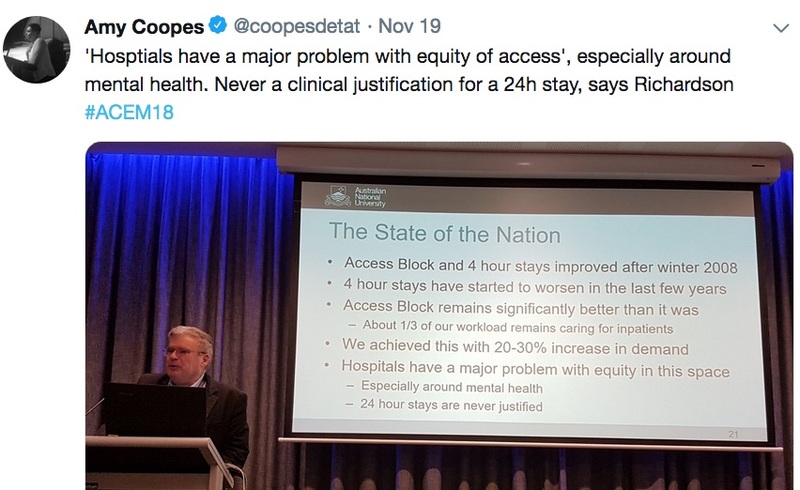 Though mental health presentations comprised just nine percent of all ED patients, they accounted for almost 30 percent of access block cases and they were almost twice as likely to wait eight hours in ED for a bed and five times more likely to spend 24 hours in the ED. 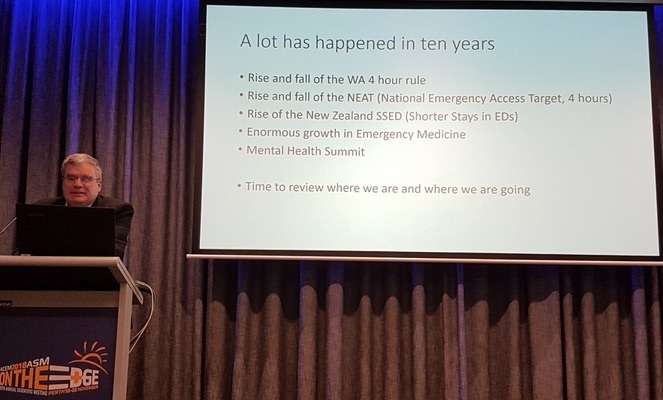 An attendee from Consumers of Mental Health WA said more “inreach” services into EDs could help with these lengthy stays, and Richardson agreed this was an important model, but not one that was widely embraced. In New Zealand, where a six-hour target was introduced in 2009, ED mortality had halved and there had been dramatic improvements to access block, Dr Peter Jones from Auckland University and Auckland City Hospital told delegates. Similar to Australia, however, he said improvements had plateaued, with early, easy gains coming up against cultural and attitudinal barriers. Instead of focusing on what the target was intended to achieve, Jones said there was now a perception of targets for targets sake, and backlash by staff gaming the system or finding workarounds. Movement of patients to a short-stay or observation unit within the ED as the deadline approached was one popular approach, and Richardson confirmed that this was also a phenomenon in Australia, where 11-13 percent of all presentations were now managed in such a unit. 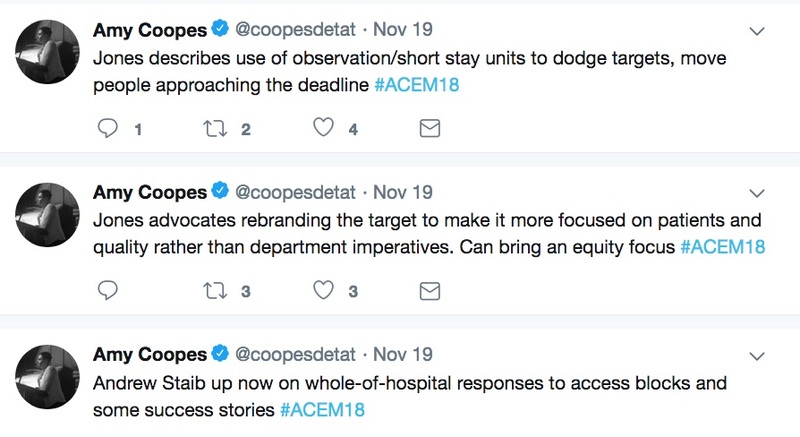 Instead of being aligned to departmental or hospital imperatives, Jones said the target needed to be “rebranded” to focus on patients, quality of care and equity of access. 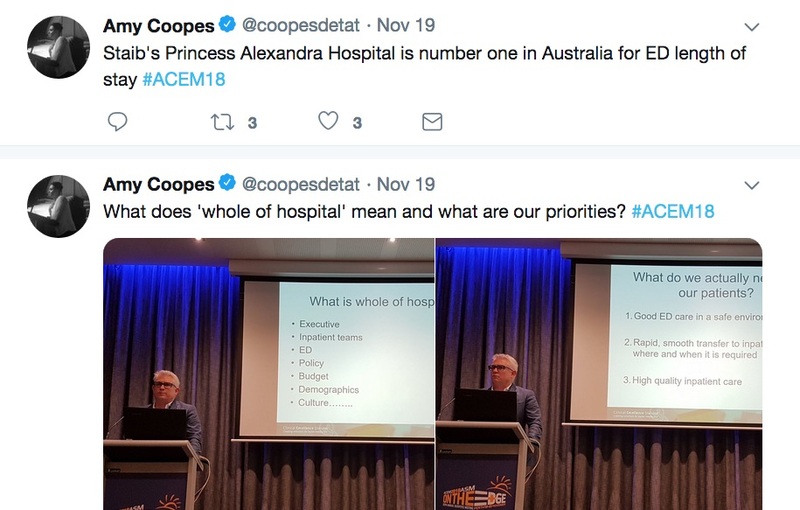 Dr Andew Staib, from Brisbane’s Princess Alexandra Hospital, said a whole-of-hospital response was required in order for targets to succeed, with buy-in from executive, inpatient teams, policy and budget staff as well as the ED, and an understanding of local demographics and culture. Princess Alexandra has seen a dramatic turnaround from one of Australia’s worst-performing EDs to one of its best, and Staib said this had been achieved incrementally, targeting the highest-volume and turnover units first and choosing priority patients. Staib said length of stay was a rudimentary proxy for patient outcomes and the time for easy wins had passed, with a need to fundamentally rethink how things were done, using granular, digitised, real-time indicators to measure patient care. Whether time-based targets were effective or appropriate was hotly debated when the floor was opened for questions. 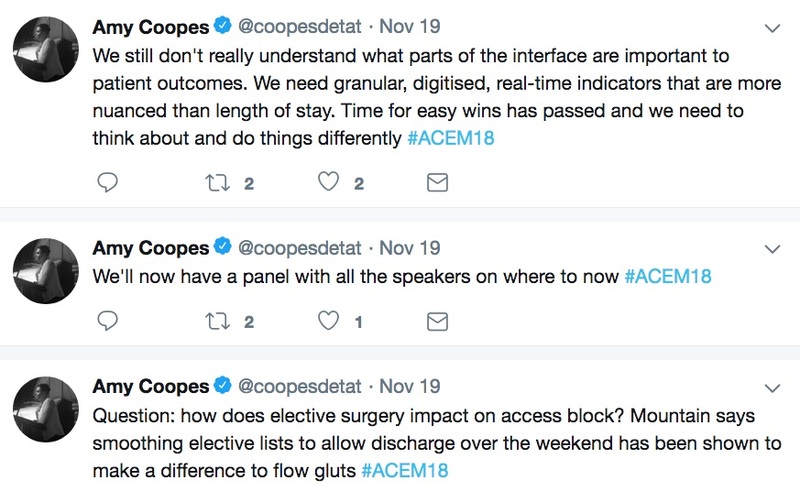 Some argued for a separation of elective and emergency streams in hospitals, others said night staffing was a real issue, with patients presenting later and later to ED, when day staff had gone home and registrars were running wards. 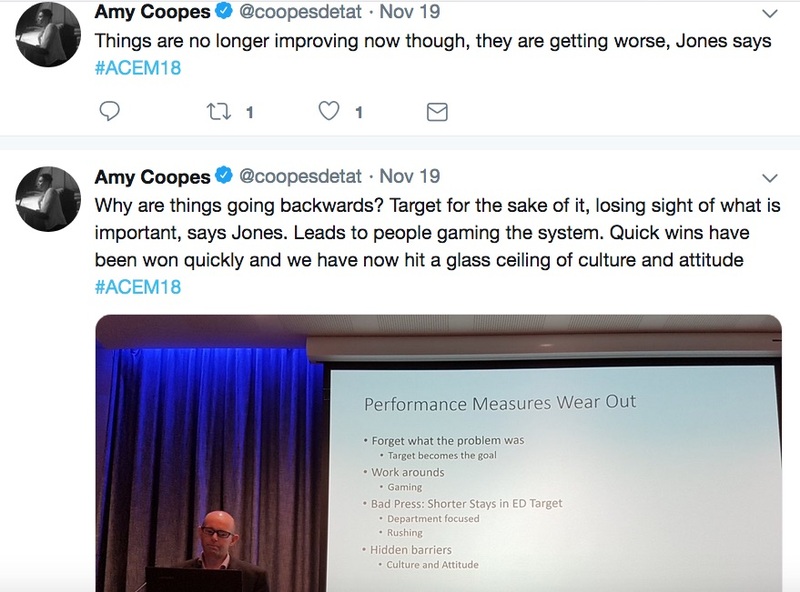 Those who supported targets said they had the potential to force improvement of systemic issues, while others advocated a move towards more meaningful patient-based metrics and a return to the question of what was important and needed to be achieved. 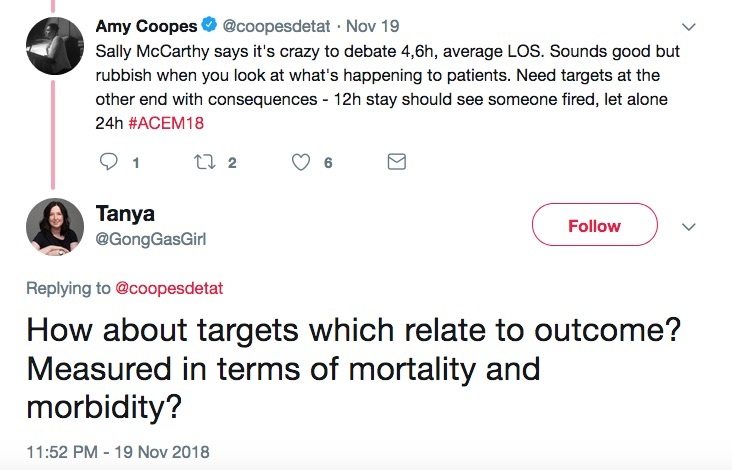 Dr Sally McCarthy, president-elect of the International Federation for Emergency Medicine, said it was “crazy” to debate numbers when this offered no information about the experiences of patients. She also advocated stricter consequences for delays, arguing that someone’s job should be on the line in the event of 12 and 24-hour stays. 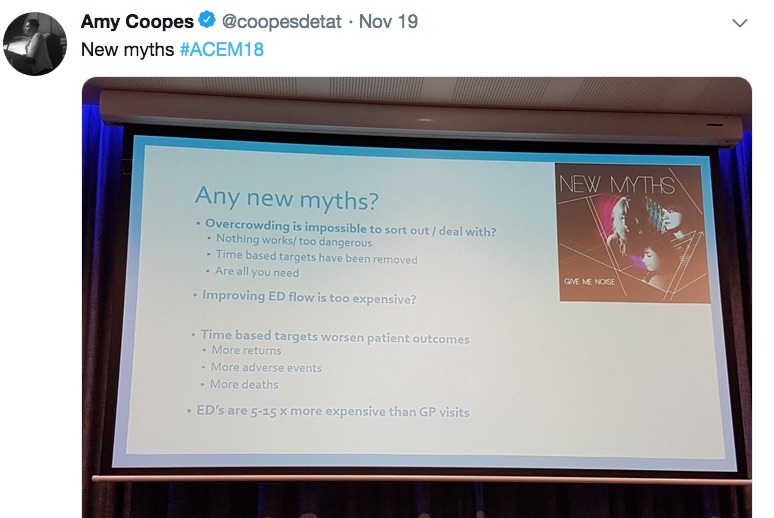 David Mountain, head of emergency at Sir Charles Gairdner Hospital and an associate professor at the University of Western Australia, delivered a robust defence of the evidence supporting time-based targets and shot down some of the most common myths. Rather than worsening patient outcomes, Mountain said studies had overwhelmingly shown that time-based targets were beneficial for patients, with decreases in ED and inpatient mortality ranging from 0.13-0.6 percent and an estimated 2,500-5,000 lives saved every year. 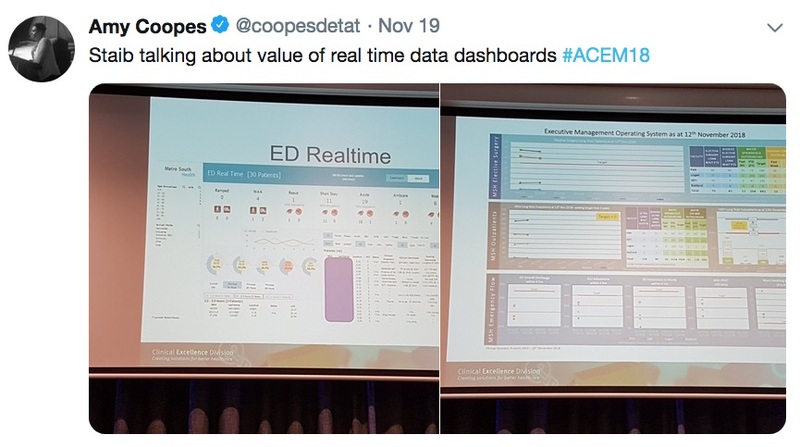 There were no significant increases in reattendance, readmission or adverse events; hospital length of stay and occupancy was reduced, as were “did not wait” events, where people left ED before they were seen by a doctor, he said. 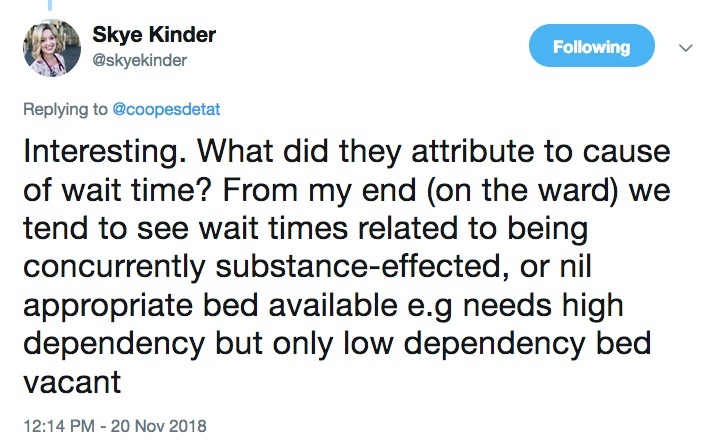 By contrast, there was a vast body of evidence demonstrating harm to patients from overcrowding, including delirium, pressure sores, incorrect or delayed administration of medications, antibiotics and analgesia, and increased mortality, as well as prolonged stays, delays to definitive care, aggression and impacts to staff morale. 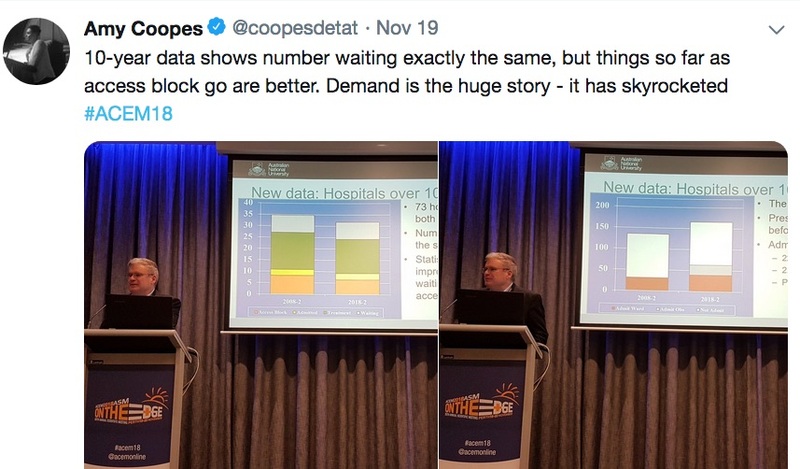 Severe overcrowding increased overall hospital costs by 3-5 percent, which translated to roughly $20 million for a large tertiary centre, Mountain said, and this didn’t account for opportunity costs, lost activity and poorer outcomes. 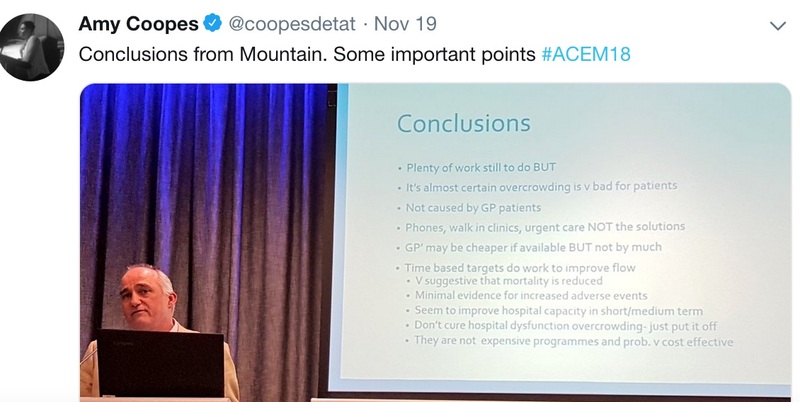 On the question of cost, Mountain said it was something of a furphy that it was cheaper for patients to be seen by a GP rather than in the ED, particularly in an era of spiralling out of pocket costs. A GP consult would bill, on average $35-100, compared with $35-250 in the ED, but Mountain said 60-80 percent of ED costs were fixed, no matter the complexity of the presentation or the time required for its investigation and diagnosis, and the bill was picked up by taxpayers. If available, a GP might be cheaper, but not by much, he said. This is of interest given recent Australian Bureau of Statistics data showing that people living in areas of most socio-economic disadvantage, and in outer regional, remote and very remote areas were more likely to visit ED than their least disadvantaged, urban counterparts. 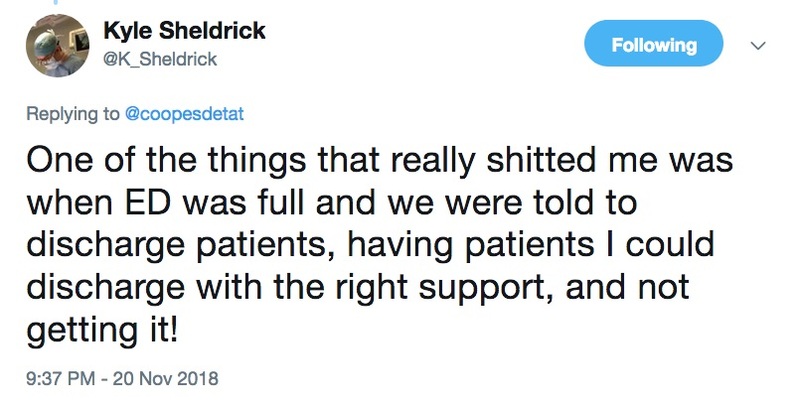 These same populations were more likely to report visiting an ED because a GP was not available, and some 18 percent of all ED attendees said they felt a GP could have treated the condition they had presented to emergency for. Mountain echoed comments from the other speakers about the waning effectiveness of time-based targets, and warned that there had been an over-reliance on them as a quick fix without substantive steps to address the capacity crisis. Targets were imposed from above without commensurate resourcing for their realisation, there were not enough inpatient beds, and community resources were also inadequate or in some cases had been reduced. Expanding EDs was not the answer – if anything, this just resulted in more crowding, he said – cautioning that running hospitals at or above capacity actually made them less efficient, not more. Resolving these issues, rather than rolling out more phone lines, walk-in clinics and urgent care services, is where solutions lay, Mountain said. • Bookmark this link to track Croakey’s coverage of the conference.